Losing information is a problem which concerns both companies and private users which must be faced on a daily basis. An attempt to recover data by unskilled personnel with inadequate tools could make it impossible to retrieve the information from your system. As soon as we have received your storage unit, we will begin to prepare a FREE diagnosis for the damaged unit. This analysis will allow us to determine the type of breakdown, how severe it is, and the most appropriate solution to achieve the data recovery. You will receive the result of the diagnosis by fax or email, no more than 24 hours after the storage unit is delivered to us. Within 71% of cases, the data is retrieved in less than 6 working days, within 89% of cases in 7 working days. Generally, longer processes are detected on the second day, and in these cases we will notify you to see if you want us to continue with the recovery operation. A maximum of three working days if the recovery is feasible. 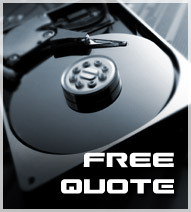 If you would like to proceed with your data recovery operation, please fill in this online form. For further information, contact us by phoning 01 76 77 75 10 or send us an email to info@aigon.com.